Creme brulee,, served with raspberries and finger shortbread, from the new menu at Graze Inn, Sheffield. If you are taking on The ASDA Foundation Sheffield Half Maratthon this Sunday, you will want some delicious food to treat yourself too when you have done all that running. Here is our round-up of some of the best places to go, and all of them are close to the marathon route. The Common Room, Division Street, is offering all runners 20 per cent off their entire food bill Sunday from 12pm to 4pm, plus they can take five people along with them to enjoy a well deserved meal. Famed for their fried chicken and seitan, dirty fries and delicious burgers, Common Room also have a range of meat, vegetarian and vegan options available. Nearby Browns Bar and Brasserie, St Paul’s Parade, has recently launched a new spring menu. Indulge your tastebuds with a choice of many rich and varied main dishes, including slow-cooked salted pork belly with crackling, red wine jus, green beans, buttered mash, or spring vegetable pot pie with carrots in white wine, leeks, peas, broad beans with buttered mash. On Ecclesall Road there are a wide range of options, but you can’t beat a good carb-loaded pizza or pasta dish after all that running. Head to the Italian Kitchen where you can get a variety of dishes to suit all tastes and dietary requirements, such as a quattro salami pizza which has tomato, mozzarella and types of Italian cured meats and a tagliatelle verdi pasta which has spinach, courgette and peas in a creamy pesto sauce. There are also burgers, calzones and risotto too. For an alternative nearby option, go to Graze Inn, which has also just launched a new menu. including mac and triple cheese, half roast chicken and vanilla pod crème brûlée, served with raspberries and finger shortbread. A bit further up the road, on Ecclesall Road South, you will find the Prince of Wales pub. There’s a full menu, including a new vegan menu so all tastes will be catered for. You can treat yourself to a full Sunday roast, with all the trimmings, including roasted potatoes Yorkshire pudding and bottomless gravy. Then, treat yourself to something sweet with choices including warm chocolate brownie and sticky toffee pudding. When you’ve got less than 10k to go, you will reach picturesque Ringinglow Road. 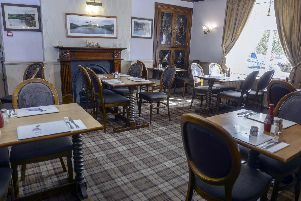 The Norfolk Arms will provide a choice of hearty pub favourites, all of which are home cooked. Options include classic sausage and mash, but with a twist as there are a trio of pork, cumberland, and pork, apple and cider sausages, and all day breakfast, with both meat and vegetarian options on offer.